Flexie lets you execute actions once an event is completed. For example, you can send a follow-up email once a lead opens a marketing email, or you can automatically add points to the lead when he/she submits a form. You can also have the workflow execute other actions such as sending sms/web and email notifications, adding task, notes, and much more. Furthermore, by setting up event-based actions, you will have a smooth workflow machine at your disposal. Any time an event is opened (a lead visits your website, for example), the system will execute the actions you have added to the workflow. For instance, you may have the workflow automatically add points upon a lead visiting your page. Whatever your needs are, whatever sales philosophy you may use, Flexie can help you reach your goals with less efforts and increased efficiency. 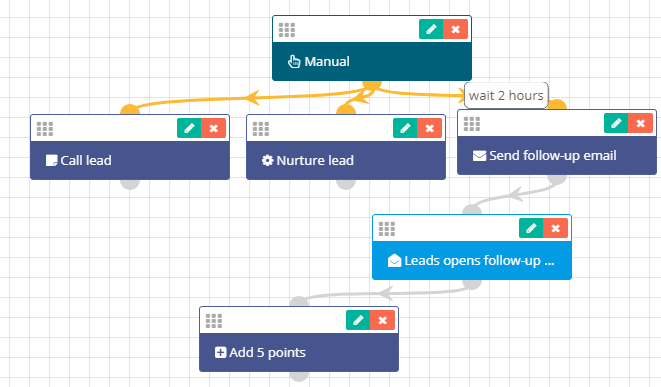 Thanks to Flexie’s CRM easy-to-use interface, you can build simple and complex workflows any time you want. Event-based actions allow you to automate tasks which could otherwise take a lot of your time. At the end of the day, you’re not all about cutting costs and increasing productivity; you want to become more efficient, you want to be able to do more with less. And that’s exactly what event-based actions let you do. They enable you to run your business as smoothly as possible. With Flexie CRM, you can set up event-based actions and build workflows for the most complex business scenarios- no matter the industry. That’s the beauty of having a fully customizable CRM at your disposal. Creating event-based actions and building accurate workflows has never been easier. With Flexie CRM, you not only increase efficiency and work better, faster and smarter; you also have fun while doing all that.